Johanna de Corby - Ale Wife. brewed on the site of the adjacent Swan Hotel. This is the earliest recorded reference to a brewery on this site. Goodman Wiggins owns the Old Swan with its integral brewhouse before Southwold's great fire of 1659. 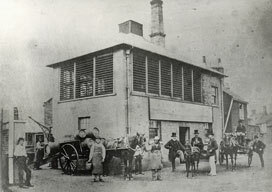 The brewhouse at this time was part of the inn and did not move to its present site until after the fire. John Rous rebuilds the Old Swan after the fire. He also owns the brewhouse which by now has been moved further back from the inn to roughly its modern location. John Thompson and his descendants own both the Old Swan Inn and its brewhouse for the best part of a century (until 1806), John Thompson is a Town Bailiff and his family is one of the most influential merchant families in Southwold. 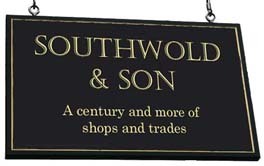 Henry Meadows, currently the landlord of the Old Swan, and Robert May, the co-owner of the Southwold Saltworks, acquire both inn and brewhouse from the Thompson family. Thomas Bokenham buys the Old Swan from Henry Meadows together with its associated brewhouse and engages in an extensive upgrade programme. Thomas Bokenham marries and, to pay off some of his debts, sells his brewhouse on this site to William Crisp for £350 (M). His brother, James Crisp, already owns the near-by maltings. Thomas Bokenham with his wife, Elizabeth, take over as Inn Keeper of their their hotel, the Old Swan. William Crisp dies, virtually bankrupt and the two maltings, the brewery, public houses, grain warehouses and the Crisp High Street home are sold at auction for a total of £2,802. See schedule here. Note: The buyer is reported in the Norwich Mercury as being Mr Woodley of Cambridge. This may be a case of mistaken identity. The person who signs the auction documents is, indeed, John Woodley, a brother of the Cambridge Woodley. However, the man who emerges as the new owner is another member of the family, William Matthew Woodley. William Matthew Woodley* is joined by Samuel Gayfer (a Walberswick Miller and son-in-law of the erstwhile owner, Thomas Bokenham.) The brewery now trades as 'Gayfer & Woodley'. Samuel Gayfer buys out the Woodley share of the business but shortly afterwards has a stroke and effectively retires from active management. Samuel Gayfer dies and the brewery ownership is left in the hands of his executors, whilst his son, George Eworthy Gayfer, takes over the day-to-day management. The Brewery is put to auction by Samuel Gayfer's executors but fails to sell. 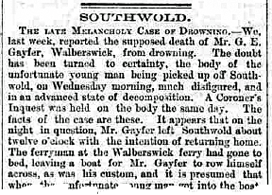 George Eworthy Gayfer dies by drowning. After a night drinking at the Crown Inn, he attempts to row himself home to Walberswick in a boat left for him by the off-duty ferryman, George Todd. He is said to have lost an oar and been swept out to the bar on the outgoing tide where the boat capsized. His body was found several days later. Samuel Gayfer's executors once again put the brewery up for auction, this time with more success. The purchaser is Samuel Haiden Fitch. Samuel Haiden Fitch put the brewery to auction but fails to sell it. 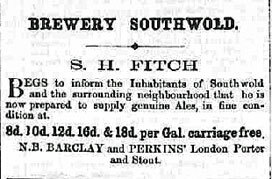 Samuel Haiden Fitch puts the brewery up for sale for the second time and it is bought by Mary Elizabeth Thomasin, the widow of George Thomasin, who had run a thriving brush factory in Witham, Essex. George had died four years earlier. Mary Elizabeth leases the brewery to her nephews, George Edward Underhill Adnams and his younger brother Ernest Michael Underhill Adnams. The Adnams brothers hail from a long-established Berkshire-based brewing family. In June, George Adnams pulls out of the partnership to go travelling and meets a premature death. Conventional history relates that he was eaten by a crocodile in the Zambezi but recent research suggests that he drowned in a South African lake. Soon after George's departure, Ernest's father. George Adnams (Snr) joins the company temporarily to support his son. 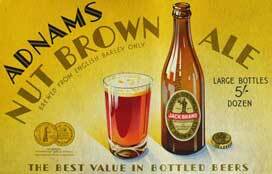 Thomas Sergeant offers to sell his share in the business to Ernest Adnams for £10,000. To raise this sum, Articles of Association of Adnams & Co Ltd were drawn up and a share issue raised.to buy Thomas Sergeant out. Frederick William Darby Robinson and Herbert Willoughby Youell join the board of the company this year. Mary Elizabeth Thomasin who still owns the freehold on the brewery premises, this year transfers it to her son, James George Thomasin. Adnams and Co Ltd are effectively his lessees. 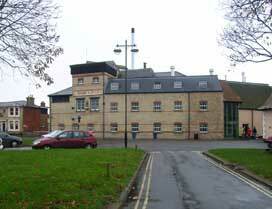 Adnams & Company Ltd acquires the freehold title to the brewery from James George Thomasin. The company embarks on a major rebuilding and expansion programme.The brewery is rebuilt and the Adnams estate now includes two maltings,The Swan Hotel, Centre Cliff Hotel, 23 licensed public houses and seven leasehold public houses as well as offices, shops warehouses and residences.The company soon soon finds itself overstretched financially and in need of fresh capitalisation. Pierse Loftus is appointed to the board. His brother, Jack, has by now returned to his work at London Stock Exchange. Edward Adolphus Holmes joins the board as does Herbert Charles Hackblock who has previously been a director of Tamplins Brewery in Brighton and the Black Eagle Brewery in Bermondsey, London. Pierse Loftus becomes Chairman. Under Pierse's guidance, Adnams has embarked on a programme of cautious expansion, acquiring small breweries in Eye and Orford. Ernest Adnams dies, having been ill for some years and not actively involved in the company. The Adnams board will have no serving member of the family until 1919. Richard French Brickwell Coling joins the board in place of Edward Adolphus Holmes. Herbert Adair Adnams, second son of Ernest and Kate, joins the board. He is also an auctioneer whose practice is at No 98 High Street. Also joining the board this year is Edward Gaymer Parke. 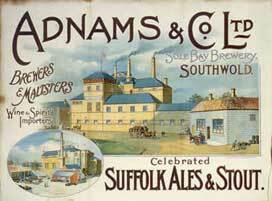 Adnams acquires Flintham Hall & Co, a brewer in Aldeburgh. Nicholas Alistair Ayton Creagh Loftus - son of Pierse (who remains as Chairman) takes control of production and the estate of hotels and public houses. John Adair Adnams, son of Herbert, joins the board. Harold William Frank Lee joins the board as Finance Director. Pierse Loftus dies in office in January this year. Nicholas Loftus is killed in a car accident. John Lee takes over as MD and, later, chairman, introducing many innovations including a pioneering employee profit-sharing scheme.. John Adnams (Grandson of Ernest) takes charge of the tied estate. Bernard Segrave-Daly (Grandson of Pierse Loftus' elder brother, Jack) becomes finance director. Simon Pierse Dominic Loftus (Grandson of Pierse, son of Nicholas) takes over the nascent wine department and oversees its expansion and transformation. Alistair Hugh Frazer joins the board. Brewery considerably enlarged and modernised to meet the rapidly growing demand for real ale from independent brewers. Bernard Segrave-Daly and Peter Joseph Futtit join the board. John Adair Adnams appointed Chairman. Simon Pierse Dominic Loftus, joins the board. Jonathan Patrick Adair Adnams, son of John Adair Adnamsappointed Technical Director. Cellar & Kitchen shop launched. Jonathan Patrick Adair Adnams joins the board as does Hugh Roberts. Adnams Charitable Trust launched to mark the centenary of Adnams' incorporation as a public company. Awarded Queen's Award for Excellence: sustainable development. Jonathan Adnams (Great-Grandson of Ernest) becomes Chairman on the retirement of Simon Loftus. Adnams embarks on a new phase of its development by opening its distillery, producing spirits for the first time. The brewery embarks on a new programme of expansion. In compiling this page, we acknowledge the help of Bernard Segrave-Daly and Robert Porter. 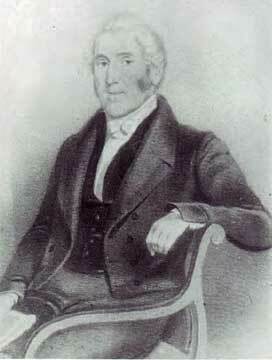 William Crisp., first Mayor of Southwold in 1836, following the Municipal Corporation Act . Reproduced from 'Bygones and Local Characters of Southwold' by Barrett Jenkins, with the kind permission of his daughter, Ann Thornton. How the Norwich Mercury reported the sale of William Crisp's, home and Chattels on Saturday 20 April 1844. The naming of the buyer as 'Mr Woodley of Cambridge' may be erroneous. We understand that the person who signed the auction documents was indeed John Woodley but he was a Corn Factor of London. 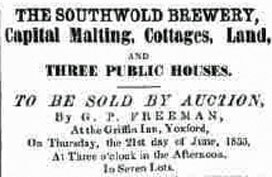 Notice in the Norfolk Chronicle of the auction on June 21 1855 of the brewery, High Street Maltings and three pubs. The seven lots failed to sell. 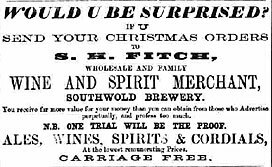 S H Fitch placed this advertisement in the Halesworth Times & East Suffolk Advertiser on 21 Jan 1862. 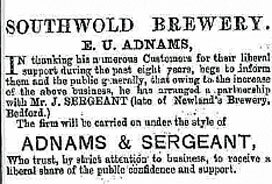 1871 Advertisement placed by S H Fitch in the Halesworth Times & East Suffolk Advertiser a year before he sells the brewery to the Adnams brothers. 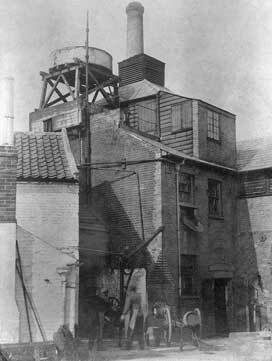 The back of the brewery in about 1895, before it was rebuilt. 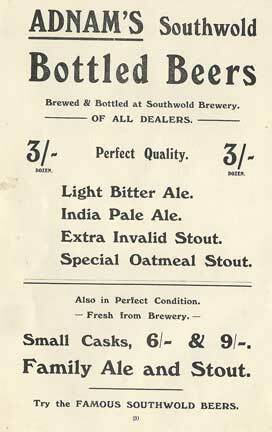 Advertisement in a c 1910 Southwold Railway timetable. 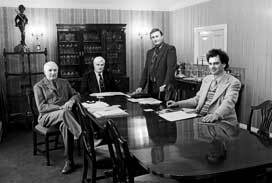 Adnams' Board of Directors photographed in the mid 1980s. From left: John Lee, John Adnams, Bernard Segrave-Daly, Simon Loftus . 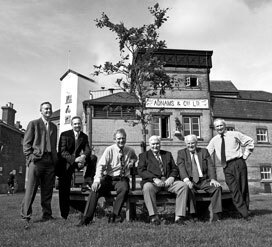 Adnams' Board of Directors photographed in 2000 . 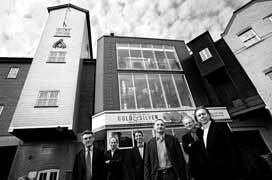 From left: Hugh Roberts, Jonathan Adnams, Simon Loftus, John Adnams, David Woodhall, Bob Nicholson . 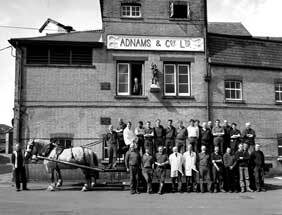 Adnams' Brewery staff photographed in 2000 posing with the horse-drawn dray which was still making deliveries to local pubs at that time..
Adnams' Board photographed in 2011 in front of the new distillery. From left: Stephen Pugh, William Kendall, Andy Wood, Jonathan Adnams, Simon Loftus, Steven Sharp.